Looking for some inspiration for your scrapbooking layouts using three different Graphic 45 collections? Look no further and hop over to Graphic 45's blog at this link. I'm featured there along with the talented Romy Veul and Arlene Cuevas. 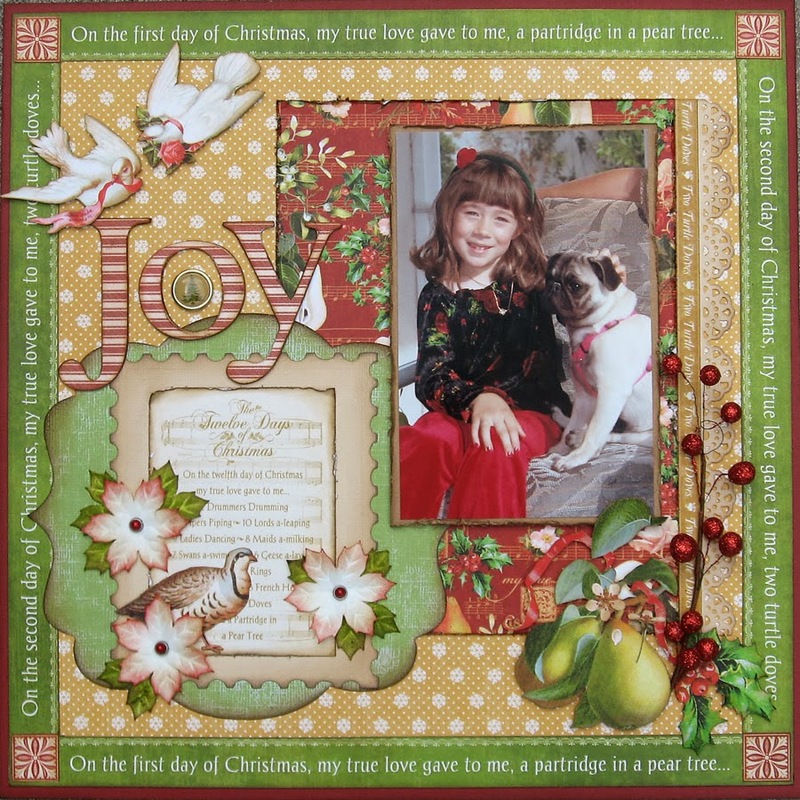 Romy shares a drop-dead gorgeous French Country layout and Arlene shows us that Mother Goose isn't just for kids' layouts. I share a holiday layout using the 12 Days of Christmas and thought I'd put it here on my blog as well. There's our little Jamie quite a few years ago with my sister's pug Nicky. 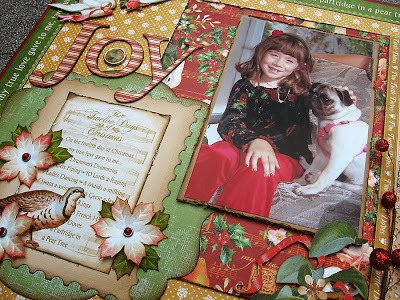 The 12 Days of Christmas papers are so lovely with the warm colors and vintage imagery. You just can't go wrong! Here I've fussy cut two turtle doves, then covered chipboard letters with the red striped paper. Inked edges always pump up the vintage appeal, of course, so I used Walnut Stain Distress ink on everything. There's the partridge hiding behind the pretty poinsettias. Those flowers are actually old Close To My Heart embellishments that I hoarded. They're pure white, so I inked them with a bit of Festive Berries, then Vintage Photo Distress inks. The leaves behind each flower are the same flowers only cut apart and inked with Peeled Paint Distress ink. I kind of have this weird love of vintage fruit and vegetable images, so when I saw these pears in the collection, I swooned! 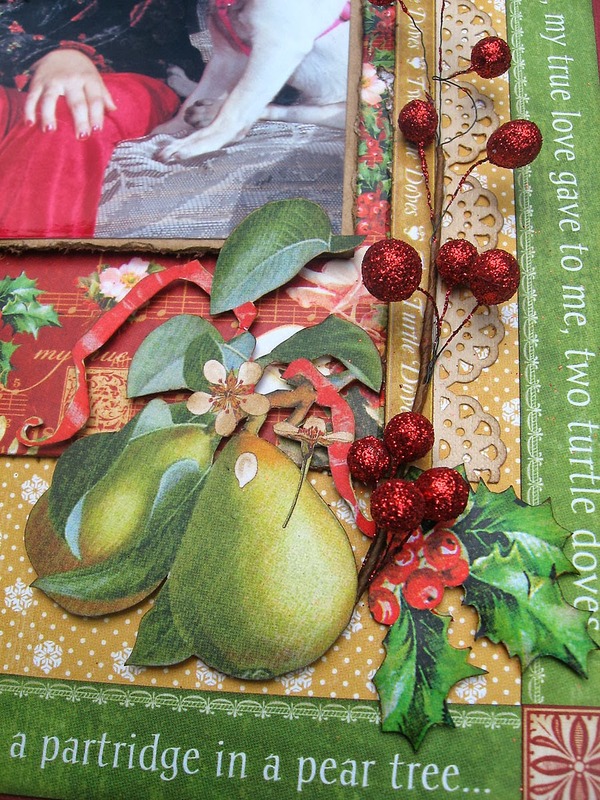 I added some other fussy cutting of holly leaves and a floral pick in my stash for some added dimension. The music page is also from the same paper collection. An edge-distresser and Walnut Stain ink are the perfect combination for aging papers like this. Sanding the surface of Core-dinations card stock is another great vintage treatment. Hope you love 12 Days of Christmas as much as I do. It's simply delicious! What a beautiful layout! It truly is just perfect! Love all the layers you achieved by fussing cutting. There IS something therapeutic about fussing cutting, isn't there?! This is stunning. Gorgeous work, Annette! 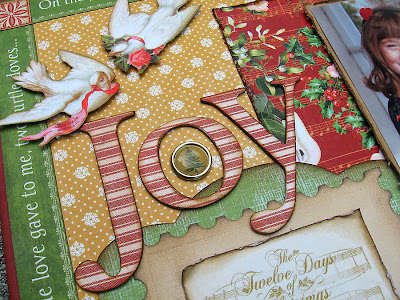 Very pretty and joyous layout for the Holiday! 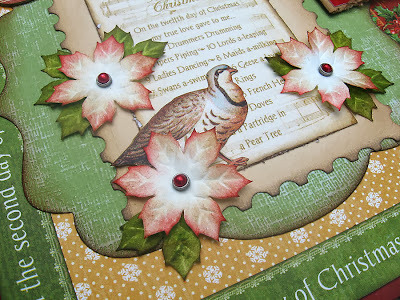 I love the paper collection and the embellishments. TFS!